Utagawa Hiroshige (1797-1858) The Famous Murmuring Pines at Hamamatsu Station from the Upright Tokaido Road Series, 1855. Oban. A second print from the so called "Upright Tokaido" series, (Tokaido Gojusan Tsugi Meisho zue). The Tokaido Road dates from 1603 and connected the two capitals, Edo and Kyoto. It was constructed by Tokugawa Iyeyasu and was used for processions of Lords twice a year to the ruler's palace in Edo. Hiroshige first travelled it in 1832, producing a fine series of prints of each of the fifty-three post-stations along the highway. He frequently returned to the subject which had made him famous, producing at least a dozen series of prints in his lifetime. What made his work so popular was that he took the traveller's vantage point, choosing to illustrate the landscape and the ordinary people of the route rather than grand temple views or dignitaries. This print depicts Hamamatsu station (The Murmuring Pines of the Hamamatsu), the twenty ninth post. In 1831 there were ninety-four inns (hatago) there for use by travellers. The station was situated on the banks of the Tenryu River which is depicted in the print. A religious procession approaches the shoreline with small sail boats in the distance. This is a desolate place; all of his previous versions share the sense of desolation - this is a cold shore line, the pine trees are bent by the wind; Hiroshige successfully conveys the unforgiving waves and the flatness of the dry beach. In this edition the figures are lost in the overarching sky and the tight margins of the shore. 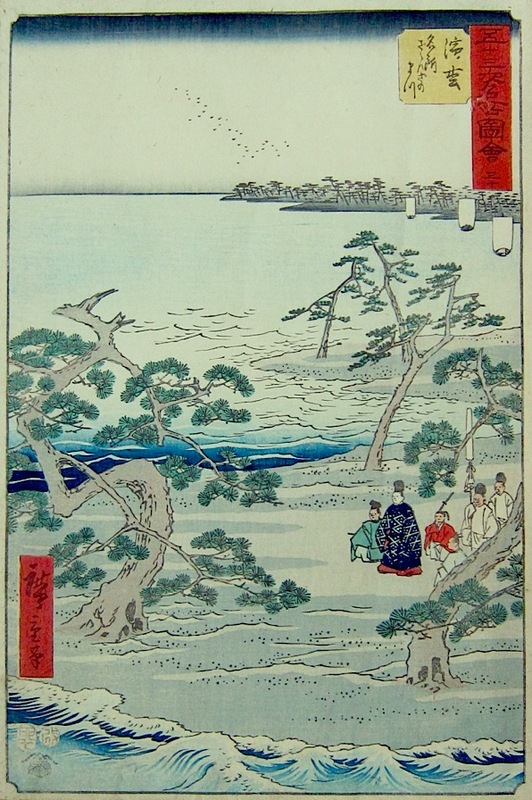 This is a fine print from one Hiroshige’s best series, full size, fine impression and condition and colour. Illustrated in Roger Keyes: The Edward Burr Van weck Collection of Japanese Prints, 1990. Signed Hiroshige ga, published by Tsutaya Kichizo.